In the first decade of the 20th Central, a number of transit mega-projects were under way in the United States. Two of the most well known are Grand Central Terminal and Pennsylvania Station in New York City. 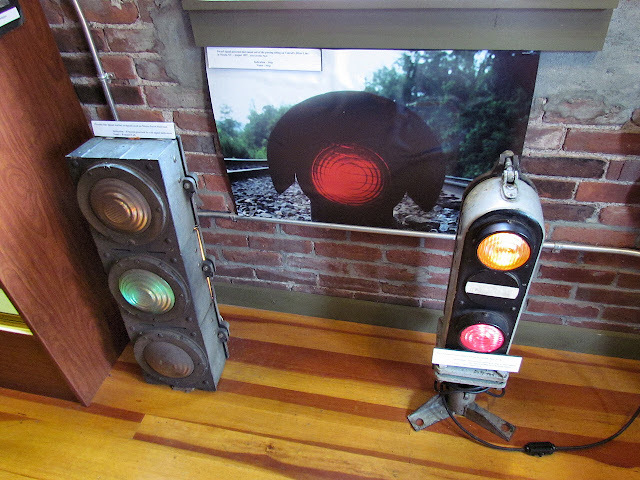 In addition to being civil engineering marvels, they also employed the latest technology in railroad signaling, which included both power operated interlocking machines and, gasp, electric signals. I've mentioned before how surprisingly difficult it was to create the first 100% electric railroad signals. This was because high intensity electric bulbs (necessary to be seen under daylight conditions) of the time would have an impractically short service life and also because electric power was in vary short supply in might of the country. 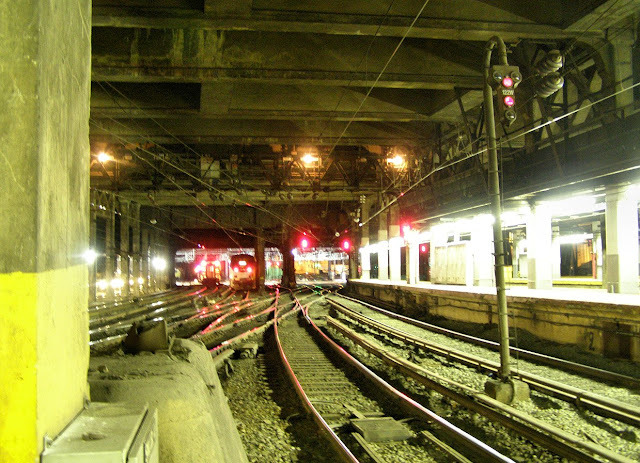 However the projects of Penn Station and CGT did not suffer from these two limitations because they were underground, where it was dark all the time and they had reliable supplied of electric power on a 24/7 basis. 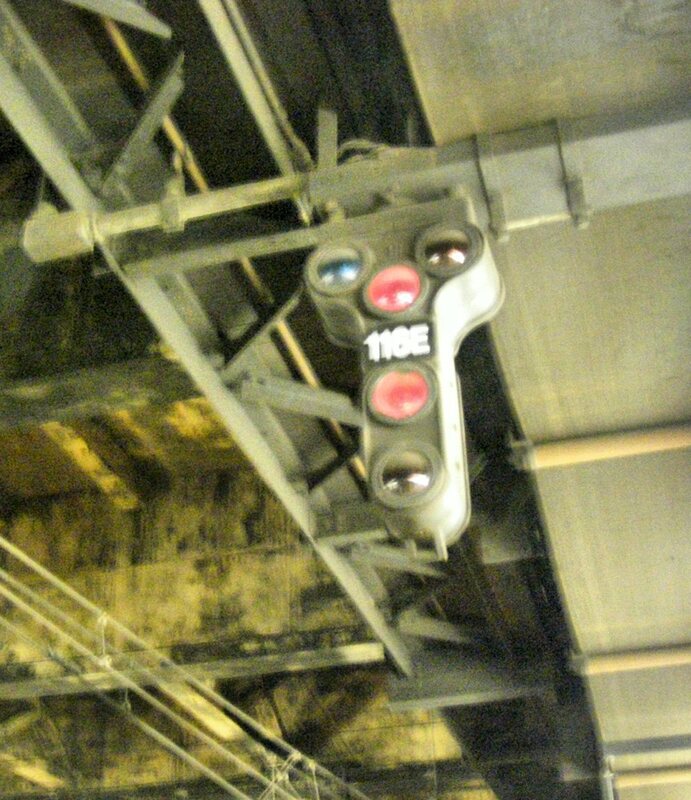 Fast forward 100 years, while Metro-North replaced all the original 1913 signals in Grand Central, across town at Penn Station, the thrifty stewardship of Amtrak had resulted in much of the 1911 not only seeing the 21st century, but doing so just above the heads of millions of dashing commuters. Union Switch and Signal, naturally, supplied the signaling for the entire projectfrom the interlocking machines to the relays to the signals themselves. The signals were a custom job that, as far as I can tell, weren't used anywhere else since the electric age kicked off a rapid period of innovation that saw both searchlights and position lights entering the market in just a few years. 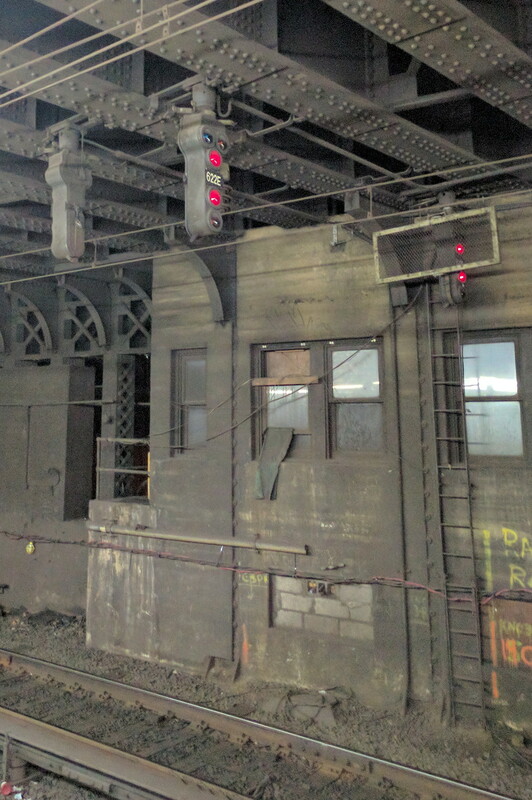 The Penn Station Signals consisted of a tri-light patterned upper head with G+Y+R lamps and then a lower head with an additional two R+Y lamps in a vertical orientation. Since the station trackage was all run at what is today known as "Slow" speed (15mph), there was no need for any of the more complex aspects such as Medium Clear or Approach Medium. 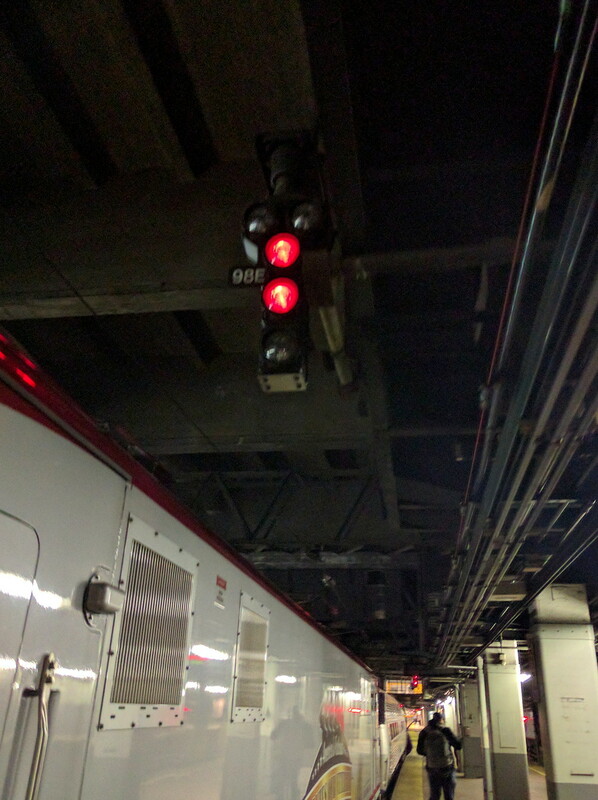 Two lamps were illuminated at all times to provide R/R Stop, Y/R Approach, G/R Clear and R/Y Restricting. In the tunnels approaching the station Y/G Approach Medium and Y/Y Approach Slow indication were employed. The Penn Station signal was a single cast iron housing with lovely rounded corners. Due to the close clearances the signal was designed to be suspended from above, this would result in some awkward "gooseneck" mast mountings as I will show later. From behind we can see how the signal was divided into two lamphouses, each with its own cast iron cover plate. 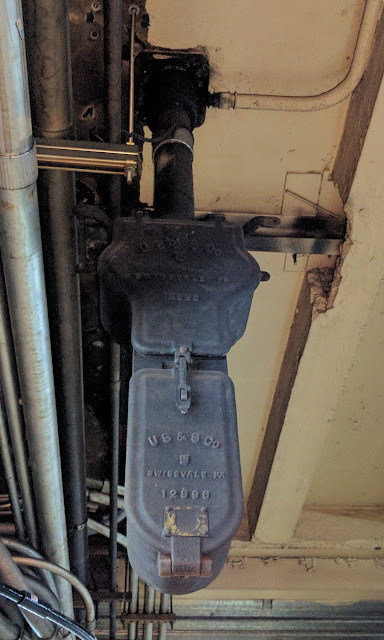 Note the very very old style US&S logos and markings. Remember, all these pictures were taken in 2017, 106 years after the signals were installed. Here we see a trio of 1911's litterally hanging out next to the now closed 'C' interlocking tower at the east end of the LIRR tracks. The colored glass lenses are still vivid even to this day, probably because they were made with all sorts of now banned compounds. Now if you think it is time to move on to the modern signals, you would be wrong as there is a second pattern of 1911 signal scattered about the complex. One such example is the famous 122W "gooseneck" signal at the west end of track 7 (remember, I said they can only be suspended from above). If you look closely you'll also notice that the G and Y lamps on the upper head are spread farther apart than on the standard Penn Station signal. Now these "googly eyed" signals could have been some experimental or pre-production batch, but if you want a more satisfying answer I might say that this pattern was intended for ABS use in the tunnels. 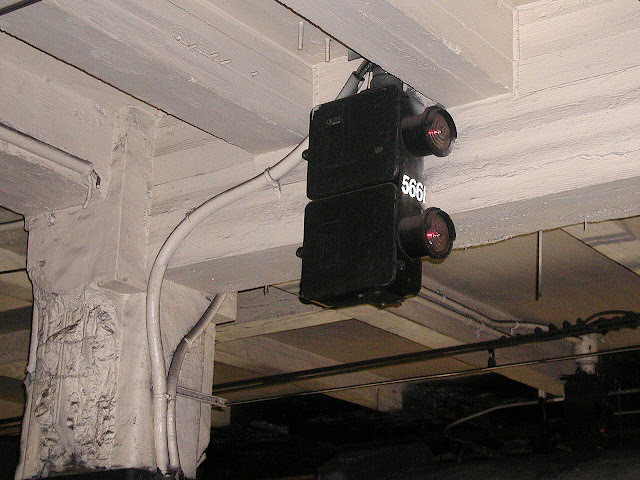 The spread upper bulbs designed to simulate the offset heads of automatic signals. 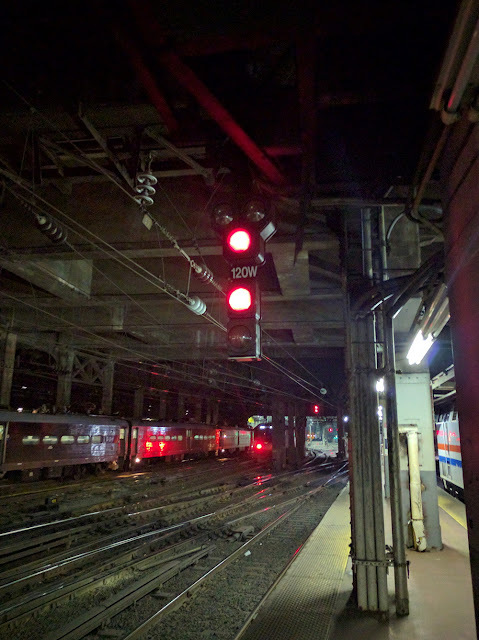 Moving into the modern period we catch this Amtrak experiment with Safetran Unilens signals hanging at the east end of track 14. Because of the problems with the Unilens that I have previously discussed, JO signal 566E appears to be an isolated incident. So what then is the modern replacement for the unique 1911 signals? 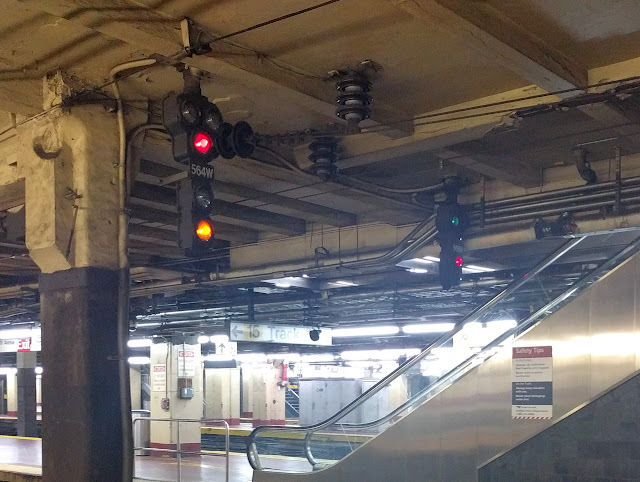 Well actually its a modernized version of the unique 1911 signals. 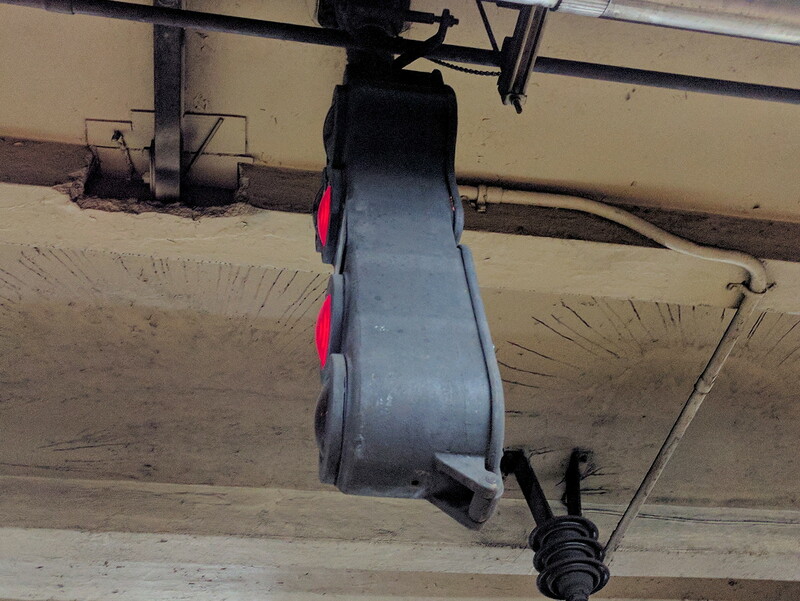 Amtrak had suspended a pair of Safetran modular dwarf units below what may or may not be a Safetran lamp housing for a target style tri-light signal. The result is a nearly perfect drop in replacement for the cast iron 1911's. Here we have an even more compact arrangement that omits the space for the "not in conformity" number plate on an absolute signal. Hey, you can't say it doesn't work. 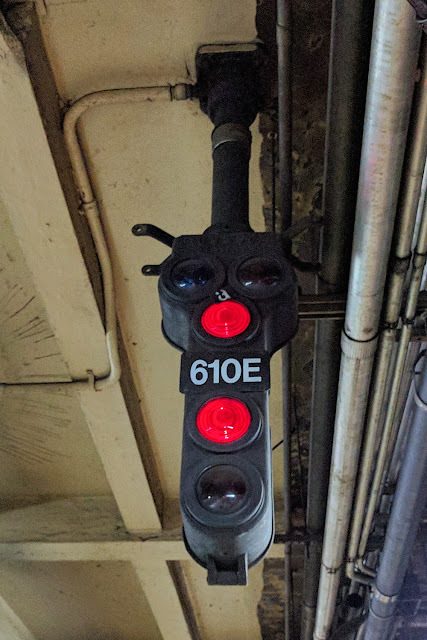 Here we can see how new and old compare at JO interlocking with the modern 564W signal displaying Restricting right next to the vintage 566W displaying clear. The modern lenses are clearly larger, but both get the job done well. In general, the former outdoor portion of A interlocking has been modernized while one is more likely to find 1911 signals scattered around JO and C, however there are many exceptions to those "rules". Of course I'm also omitting the smattering of PRR position light dwarf signals scattered around the yard areas, but you've seen those before. Anyway, I hope you've enjoyed this little tour of Penn Station. Most of these photos were brought to you by the magic of modern smart phone cameras that excel at taking photos in low light conditions and also won't attract swarms of police and security officials. Next time you are in Penn Station I urge you to look up and if you see something interesting, document it. After all, nothing lasts forever. How many signals are there in Penn? I could count them off the diagram, but it would take some time! I'd estimate about 200 or so.